How To Watch Rousey vs Nunes UFC 207 Live Online ? 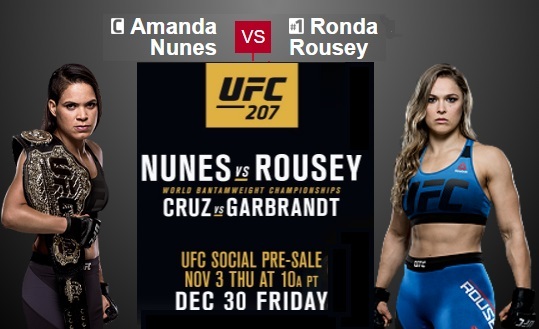 UFC 207 will be taking place on Friday night, 30th december 2016 which will be the last big event of this year headlined by Ronda Rousey vs Amanda Nunes in what should be a cracking of a fight card. It will be taking place at the newly built T-Mobile Arena in Las Vegas and there are number of high profile fighters on the undercard. US viewers can order the PPV through their local cable providers or visit (ufc.tv/events). UFC 207 Live Coverage Details (Worldwide): It will be the last PPV event from UFC this year and they will be hoping to end on a high. A very attractive and versatile undercard which has current and former champions fighting in all sort of weight classes headlined by grudge fight between two of the finest women fighters in Ronda Rousey and Amanda Nunes fighting for Bantamweight women’s title. If you want to get live action of this card you will have to order the PPV. If you are located in Europe you can check your local listings for live coverage of UFC 207. In United Kingdom BT Sports will have entire fight card live while viewers from countries like Netherlands, Romania, Italy, Greece, Poland etc can get Exteme Sports channel on their satellite TVs. However if you are located in a country where you won’t have live coverage of UFC 207 you can always tune in to some dedicated sport streaming sites. Although the streams are usually choppy and very unreliable they are better than missing out on the action completely. We will be placing short fight highlights after nights coverage is done. Really excited for the tie. VPNSports has a really simple guide for you if you want to stream it live. Visit their website.